Premium full day whale watch tour departing Hervey Bay. Maximum 46 passengers, includes freshly baked morning tea, tropical buffet lunch and fruit and cheese platter on the way home. Plenty of time to interact with the whales. 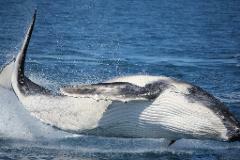 Whale watch Gift voucher on our 9:30 to 3:30pm daily tour between late July to end of October.